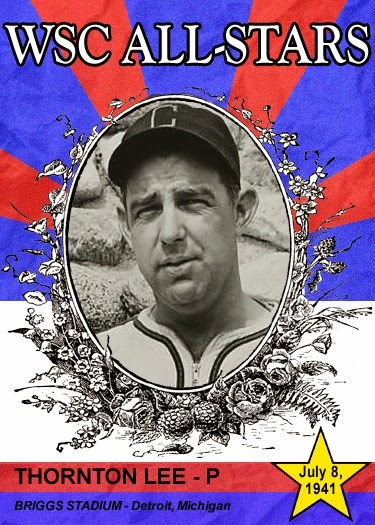 Thornton relieved St. Louis Browns outfielder Roy Cullenbine, who pinch hit for Cleveland Indians starter Bob Feller in the bottom of the third inning, to start the fourth. He ran into a little trouble in the top of the sixth inning, when Cincinnati Reds pitcher Bucky Walters hit a double and St. Louis Cardinals center fielder Terry Moore's flyball to deep left field scored him. Lee had one at-bat in the bottom of the fifth inning off Cincinnati's Bucky Walters, where he lined out to Brooklyn Dodgers center fielder Pete Reiser in left center, but moved Detroit Tigers first baseman Rudy York to third base. Hector was signed by the New York Yankees in 2004, but didn't play in their minor league system until 2006. While moving up the Yankee minors, Noesi was injured in June 2007 and required Tommy John surgery., which sidelined him until July 2008. Hector finally made his MLB debut with the Yankees on May 18, 2011 in Baltimore. He ended up winning that game in the bottom of the fifteenth inning. Noesi was traded to the Seattle Mariners before the 2012 season, where he stayed until he was purchased by the Texas Rangers on April 12, 2014. After three games with Texas, Hector was selected off waivers by the Chicago White Sox on April 25, 2014. Despite a rocky start in Chicago, Noesi has settled into a mostly stable starting pitcher. 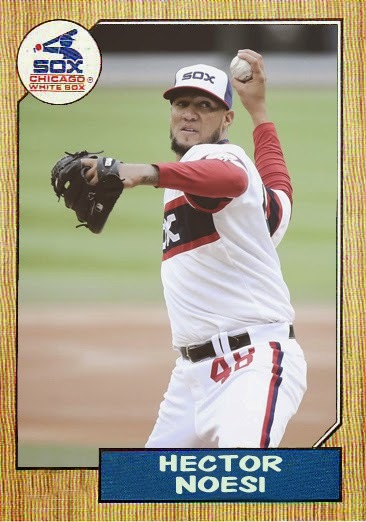 He was the ninth starter in 2014 for the White Sox. 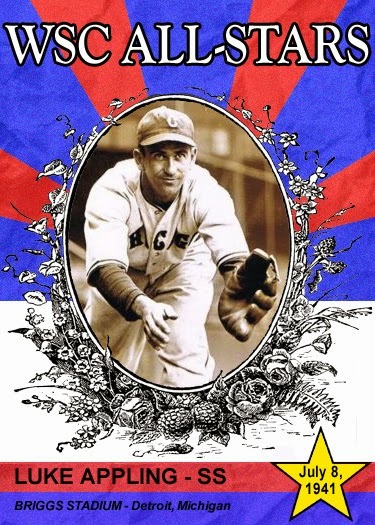 Luke was a reserve shortstop in the 1941 All-Star Game at Briggs Stadium in Detroit, Michigan. Boston Red Sox shortstop Joe Cronin started for the American League and Cleveland Indians shortstop Lou Boudreau replaced Cronin in the top of the sixth inning. Appling did not play. This set wasn't discovered by most collectors until the 1970s, when a large cache was found. Before then, it was virtually unknown until a decade earlier. At sixty-eight cards, it should seem like an easy set to attempt, but it has frustrated even the most savvy of ephemera enthusiasts. Beckett lists this set as 1911, but the majority of collectors identify this as 1912. While there are photos shared with E145 Cracker Jack and PC796 sets, this set is definitely scarcer. Cards are unnumbered and typically blank-backed, although some do appear to have advertisements on the back. In the future, other cards in this set may be found, but right now it stands at sixty-eight cards. 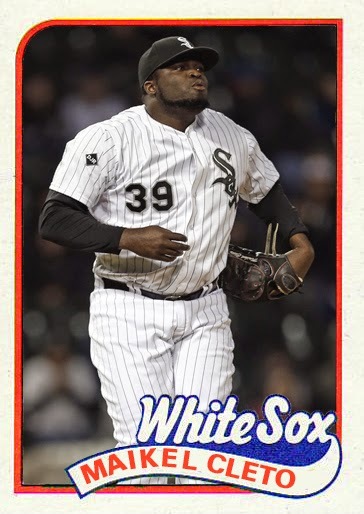 The White Sox have four cards in the set. The cards are three inches by four inches, with a large distinct 2 1/4 inch by 3 5/16 inch picture dominating the space. The set also features sturdy stock. This is definitely in the category of white whale set. Examples don't become available often enough to be a realistic collecting goal. The team set completion may be a better goal, but still one that will likely tax your resources and luck. There were no players elected this year and George Dickey received too few votes to be on next year's ballot. Unfortunately no one was inducted into the WSC Hall of Fame Class of 2014! There will be a new player at catcher on next year's ballot. I did see a nice upward trend in votes for most of the holdover players. The top four gained considerable ground since last ballot. Most players that fell into the bottom four were on teams from the first decade of White Sox baseball. Most people aren't familiar with them and I encourage those of you who aren't to read up on them. 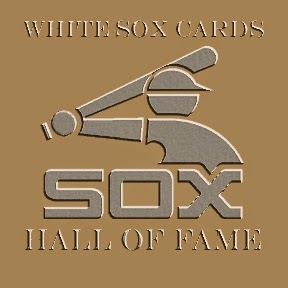 Their great plays are the foundation of what White Sox baseball stands upon. Gary Peters made a huge leap from 26% to 42% since 2013! Maybe those almost teams of the sixties are finally getting the appreciation they deserve. Perhaps next year will be a better year for the nominees to be inducted into the WSC Hall of Fame! The voting for the Class of 2015 will begin some time after the World Series is concluded. 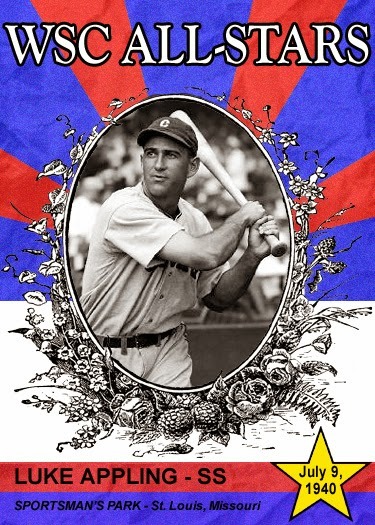 Luke was the starting shortstop for the American League All-Stars in 1940 at Sportman's Park in St. Louis, Missouri. He went two for three at the plate, hitting a double off of Cincinnati Reds starting pitcher Paul Derringer to right field in the second inning, and a single off of Chicago Cubs pitcher Larry French in the eighth inning. Cleveland Indians shortstop Lou Boudreau replaced Luke defensively in the bottom of the eighth inning. Appling was the lone representative for the Chicago White Sox in 1940. The National League won the game 4-0. Maikel was originally signed as an amateur free agent on August 10, 2006, by the New York Mets. He was traded to the Seattle Mariners on December 11, 2008, in a three way trade involving the Cleveland Indians. Just over two years later, Cleto was traded to the St. Louis Cardinals on December 12, 2010. Maikel made his MLB debut on June 2, 2011 when the Cardinals brought him up from AA to relieve an overworked bullpen. Cleto would remain with the Cardinals for parts of three seasons, until he was claimed off of waivers by the Kansas City Royals on June 23, 2013. Maikel did not make it to the Royals' parent club and was selected off waivers by the Chicago White Sox on February 26, 2014. 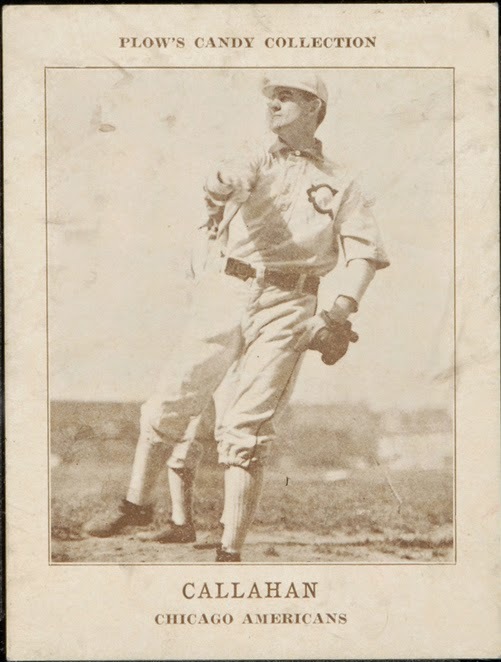 Cleto pitched fourteen innings over thirteen games for the Pale Hose between April 2nd and May 8th, producing a 5.14 ERA. His last appearance, on May 8th, sealed his fate with the ChiSox. Maikel gave up five runs over two innings to the Chicago Cubs. His season ERA jumped from 2.25 to 5.14. 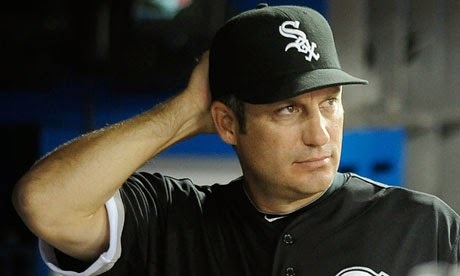 Cleto was released by the White Sox on July 1, 2014. 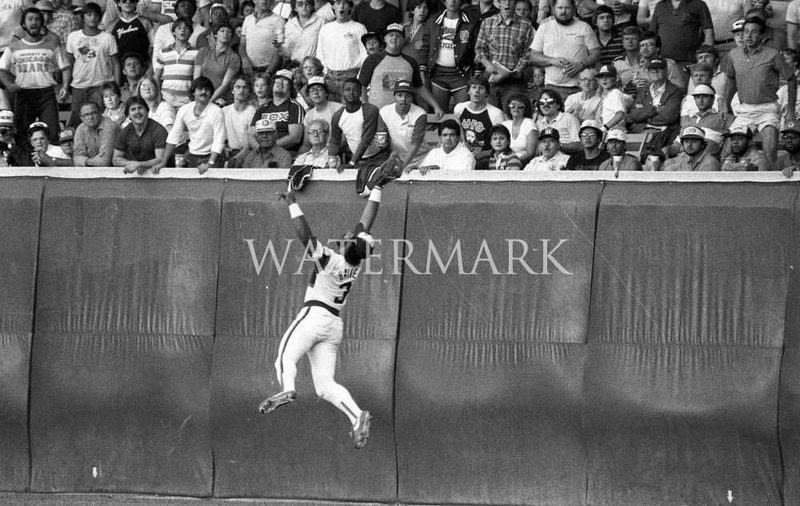 An elusive photograph of Harold Baines making a leaping catch has made its way onto eBay. Very few seem to remember Baines as an outfield threat, just as a clutch hitter. Almost every baseball card I have of Harold features him either hitting, standing or somewhere on the base paths. One even included him sliding into a base! Very few cards show him in the outfield, where he roamed before his knees weakened and forced him into an almost full time DH role. So it's nice to see photographic evidence that my memories were not tainted as a kid. Everyone seems to recall the hitting prowess, but that always eclipses the fielding skills in most people's memories. I'm fully aware that I haven't been posting much. It's not that I have lost interest in the White Sox, baseball or baseball cards... I haven't. Time has a way of slipping away quickly when there are multiple projects taking your time. The biggest and most important project on the horizon is my wedding, which takes place in less than two months. Those of you that are friends with me on Facebook may have noticed numbers popping up on my personal page. The countdown is in full swing! I'm happy to report that the wedding is baseball themed and it takes place within walking distance of a baseball card shop. The card shop proximity wasn't planned, but I take that as a wonderful sign. Work has also taken a lot of my time lately. Not only am I loving my job, but I've been working on multiple books that are all getting nearer to completion. Of course family takes up time too and with a lovely soon to be wife and a wonderful step-daughter to spend time with, I get away from the blog more than I probably should. With 2,750 previous posts, I think there is plenty to rediscover on the days I don't get to posting.